Michigan Sneaker XChange was founded over 6 years ago as a safe place for the Michigan sneaker community to come buy, sell, trade, and enjoy sneaker and streetwear culture. We have strived to improve every event, bringing out thousands of sneaker heads from over 15 different states over the years. Michigan Sneaker XChange is not going anywhere, however, because of the amount of planning and time that goes into each Michigan Sneaker XChange event, we are only able to host 2-3 events per year. Because of that, we are introducing Trade Wars. 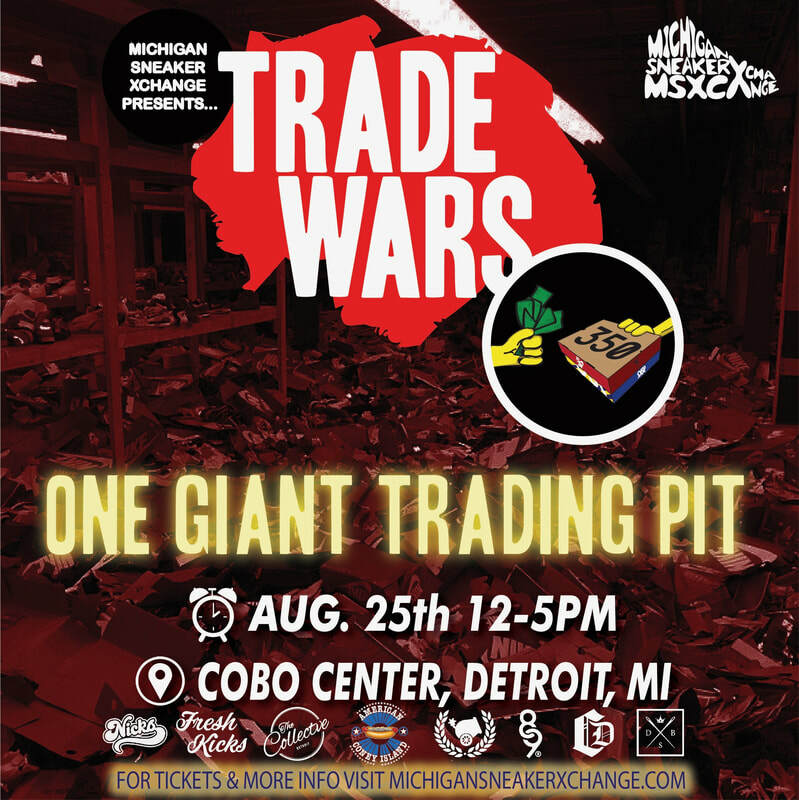 Trade Wars will be a new event, run by Michigan Sneaker XChange in the months between Michigan Sneaker XChange events. We plan on having at least 4-5 Trade Wars events per year. The concept is similar to Michigan Sneaker XChange events, but without the vendors. Trade Wars will be hosted in a room in Cobo Center that is approximately half of the size of the current Michigan Sneaker XChange room. We will have 5-10 curated vendor displays, and/or interactive displays from sponsors. Admission tickets will be offered for as low as half of Michigan Sneaker XChange admission, and attendees will have the option to purchase VIP tickets to bring in more items and come into the event early. Once inside the event, attendees are welcome to setup their items anywhere they please, or walk around to buy, sell, and trade their items within the event. Additionally, we will have raffles, giveaways, food, drinks, & much more at the event. The first Trade Wars event kicks off August 25th at Cobo Center from 12-5PM. Get your tickets now! Sponsored by Nick's Chips, Fresh Kicks, The Collectve, American Coney Island, Loose Cannon Flagship, 8and9, Custom Distressing, & Detroit Boxed Socks.